Versatix MP bi-metal band saw blades from L.S. Starrett Co., for cutting ferrous and nonferrous metal alloys, feature triple-tempered, high-speed M-42 cobalt-steel teeth with a steel-alloy steel backing strip. The blade’s patented tooth design dissipates stress during cutting, resulting in less tooth breakage and longer blade life than with other tooth designs, according to company officials. And, the tooth design’s special set minimizes pinching when cutting structurals and bundles. 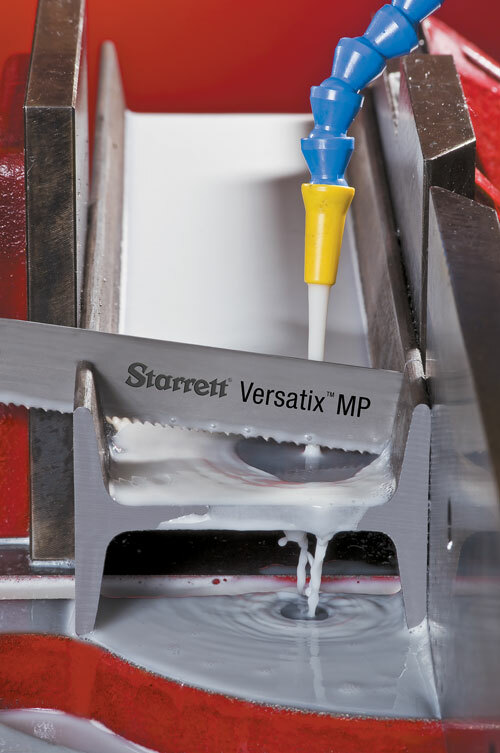 The saw blades include Starret’s Bi-Metal Unique technology, which joins two strips of high-speed-steel wires to the backing steel using solid-state diffusion bonding. Instead of a single wire welded to the outside of a steel backer, explain company officials, this process bonds two strips of high-speed steel to each side of the top edge of the steel backer using intense heat and pressure. This increases the bonding area between the backer and the high-speed steel by more than 170 percent as compared to conventional electron beam or laser welding. This process reportedly creates a stronger, longer-lasting blade.